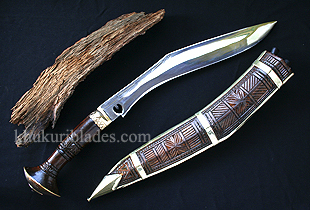 Newer version of Chainpure khukuri with better looks, new touches, longer reach and with a carved rosewood case. This is the newer and nicer version of the Chainpure kukri.The shape of the knife is made like that of chainpure, however with a better touch. The fordging of the blade from the tip all the way down to the notch makes this kukri very special, as this is the hardest part of crafting for the skilled craftsman costing more effort and time. Rose wood handle but with a improved handle is made for better grip. The scabbard is made from Indian rosewood and is hand carved using domestic hand tools for its beautiful looks. The hole at the end of the blade is the trademark of Chainpure village.